Yu-Gi-Oh! TCG Event Coverage » YCS Pasadena: ATTACK OF THE GIANT CARDS!! Home > 2018/11 - Pasadena, CA, Yu-Gi-Oh! Championship Series	> YCS Pasadena: ATTACK OF THE GIANT CARDS!! One option for Duelists to take home is Prank-Kids Dodo-Doodle-Doo. Good luck saying this monster’s name 5 times fast! This Link 2 Prank-Kids monster is critical to any Prank-Kids strategy and helps to pull together the Prank-Kids theme. 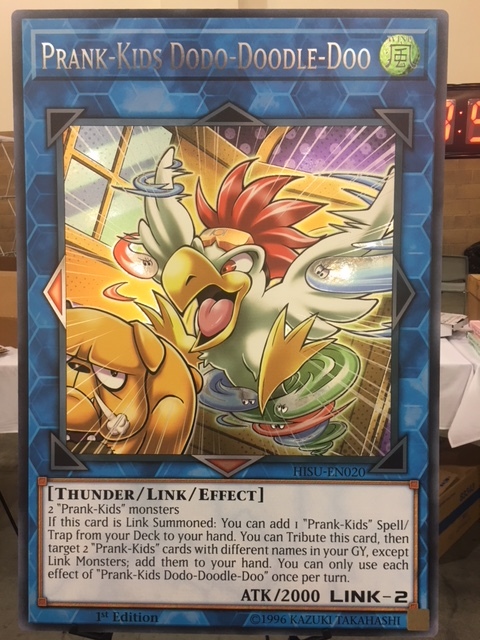 It’s still early in the tournament, but as you can see from the Round 1 Feature Match, Prank-Kids Dodo-Doodle-Doo is proving to be one of the most competitive new cards from Hidden Summoners. The other option for Duelists to take home is Cerulean Sacred Phoenix of Nephthys. This beautiful monster is a work of art. 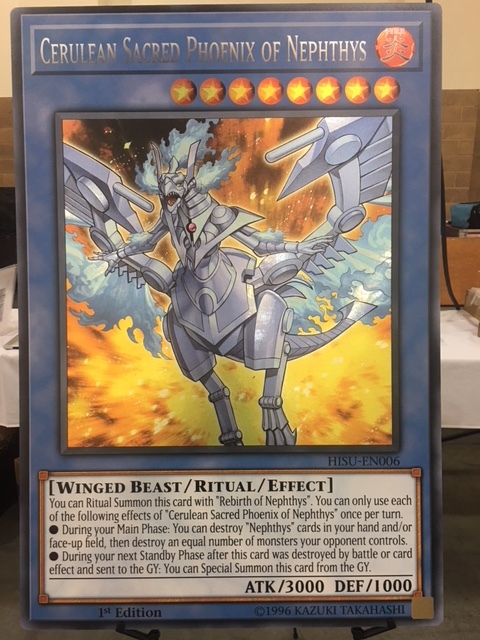 Cerulean Sacred Phoenix of Nephthys doesn’t seem to have the tournament presence that Prank-Kids Dodo-Doodle-Doo has this weekend, but it’s not without its fans. Reminiscent of the Sacred Phoenix of Nephthys from Flaming Eternity, Cerulean Sacred Phoenix of Nephthys breathes new life into an old theme and is one of the most popular cards in Hidden Summoners. Follow the coverage to see which GIANT card is claimed first here at YCS Pasadena!